Industrial states and countries took action quickly to curb chlorofluorocarbon (CFC) use starting in 1977. The first global meeting was held in 1985 at the Vienna Convention. Although no formal global actions were agreed upon, the international community supported immediate scientific investigations. Two years later (1987), 27 nations signed the Montreal Protocol, which required the participating countries to cut CFC production in half by 1999. 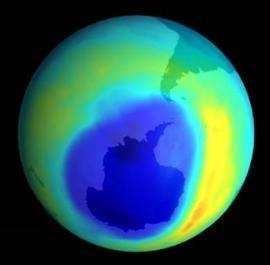 Continued research indicated that these reductions would not allow the stratospheric ozone layer to recover based on the actions taken and that new materials could be developed that were safe (or at least less damaging) for the stratospheric ozone. Over 80 nations met in London in 1990 and agreed to the complete elimination of ozone-depleting substance (ODS) production by the year 2000. But new research showed that even these dramatic precautions were not enough to reverse the loss of ozone within the stratosphere. The political and scientific communities met again in 1992, armed with the most recent research. The international community signed the Copenhagen Amendment 1992, agreeing to a complete phase-out of CFCs by 1996 and a reduction or phase-out of HCFCs (hydrochlorofluorocarbons, a less destructive replacement chemical) by the year 2030. As new research on the destruction of ozone and the development of suitable replacements for ODSs became available, the conditions of the 1987 Montreal Protocol were modified toward more stringent restrictions of the production and use ODSs. The table on the next page illustrates the global efforts to limit the use and production of ODSs during the past two decades. Have all these global agreements and actions made a difference? Most definitely, yes, because without these drastic modifications of the Montreal Protocol, emissions of ODSs would still be at levels where the rate of ozone loss would still be accelerating. CFC/ODS consumption and emissions have decreased drastically since the late 1980s. Rates of emissions of the two most common CFCs (CFC-11 and CFC-12) have decreased between 50‑67%. But many of ODSs have very long chemical lifetimes and are still in operational use today. So despite a dramatic drop in rates of emission, total concentrations of ODS decreased only about 3% between 1994 and 1999. 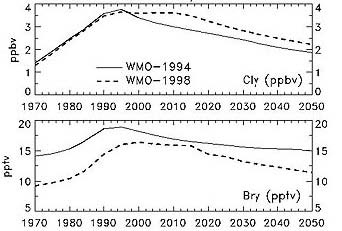 Chlorine levels in the stratosphere could return to their pre-1980 levels of 2 ppb chlorine by 2050. How is the stratospheric ozone responding to the decreasing amounts of ODSs? The long chemical lifetimes of ODSs and the randomness of their releases make predictions for recovery of the stratospheric ozone difficult. During the spring of 2000 in Antarctica, the size of the ozone “hole” at the Antarctic was roughly three times the area of the United States, the largest size ever observed since satellite measurements began in the 1970s. A factor that had not been considered until recently is possible global climate change resulting from the increasing amounts of man-made pollution in our atmosphere. Over the past several decades, the average stratospheric temperature has decreased between 3°C to 6°C. Scientists are searching for the reasons why the stratosphere is cooling while the troposphere is warming. Global warming may be offsetting the effects of phasing out ozone-depleting chemicals, since as the stratosphere cools, the chemical reactions that destroy ozone are favored. A key challenge in atmospheric chemistry is control of variables being studied. In a laboratory many of the variables can be controlled, and boundaries can be created. But in atmospheric chemistry there is no control of the natural processes and there are no boundaries to limit variables or the number of chemical components in the system. One has to eventually understand all of the chemical processes. 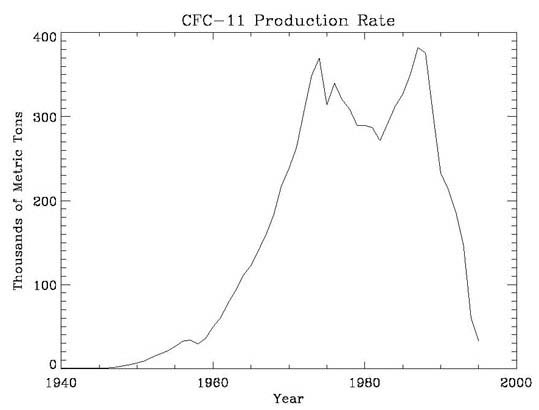 Global production of CFC-11 oover time. (Graph courtesy of NASA.) 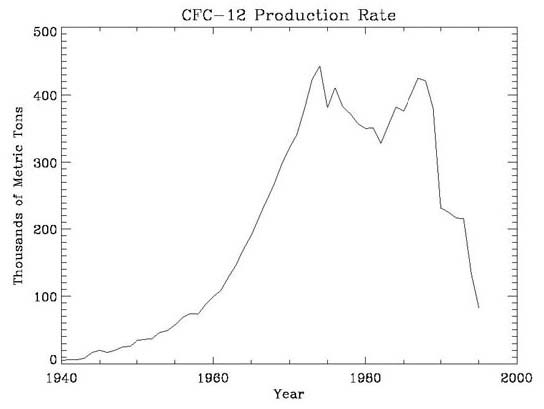 Global production of CFC-12 over time. There is so much more to do. Cutting the use and production of ODSs is only one aspect of helping recover the stratospheric ozone levels. Despite the ban in production of CFCs, there are tremendous amounts of the gases still in use and still stockpiled for use in developing countries. Can these gases be recovered, destroyed, or modified before they are released into the troposphere for their long journey to the stratosphere? Is there a way to remove the chlorine component of many of the ODSs from the stratosphere that is already there? Remember, one chlorine atom can result in the destruction of hundreds of thousands of ozone molecules. A large quantity of CFCs are still in use today, and recovering these before they are released into the atmosphere is critical for replenishing the stratospheric ozone layer. One area of focus is recovering the CFCs from construction insulation. Rather than putting old insulation into landfills or burning the materials, techniques are being developed to recover the CFCs rather then release the gases into the atmosphere. There remain huge quantities of CFCs already produced. What will happen to these? Under the 1992 Copenhagen Amendment the stockpiles of CFCs could still be used. Manufacturers have been accused of stockpiling vast quantities of CFCs prior to the stoppage date of production. The American automobile industry is believed to have up to 100 million pounds stockpiled. What can be done so these materials do not end up being used and ultimately harming the ozone layer? There are two options: either convert them to safe, useful alternatives that do not harm the stratospheric ozone layer or destroy the CFCs before they are used. Considerable work has been done to find cost-effective techniques to convert the stockpiles of CFCs to ozone-friendly “drop-in” replacement materials. Any replacement material must be able to do the original task, such as cooling your family’s refrigerator, as efficiently and as safely as when using the CFC. Since the new “drop-in” material will be swapped for the CFC, people are spared the cost of buying new machinery to change over to the newer, safer technology. One of the keys to having global cooperation to eliminate ODSs is that the cost of the solutions cannot bankrupt the economies of participating countries. In addition to seeking environmentally safe “drop in” replacements, existing machinery can be modified to use the safe substitutes for CFCs. This saves the cost of mass producing new technology and the waste of the unusable older machinery. The first replacements for CFCs were hydrochlorofluorocarbons (HCFCs) which don’t destroy as many ozone molecules in the stratosphere as CFCs do. Although safer, the use of HCFCs is scheduled to be phased out by 2030. The latest work is focused on hydrofluorocarbons (HFCs) as a replacement for CFCs since there are no chlorine atoms in the molecule. Once suitable replacements are identified and if they have similar chemical behavior to CFCs, scientists could then develop a technique to convert the existing CFCs to the replacement. This is similar to how CFCs were developed in the first place: hydrocarbons were used and chlorine or fluorine was substituted into the positions of the hydrogen atoms. DuPont has already patented a process to convert CFC-113a to HCFC-123 by substituting hydrogen for a chlorine atom. If the existing CFC stockpiles cannot be converted to an environmentally safe replacement, then the CFCs could be destroyed before they are used. In 1996, Yale Professor Robert Crabtree and graduate student Juan Burdeniuc produced a substance derived from rhubarb, called sodium oxalate, that can be used to harmlessly destroy the stockpiles of CFCs. The process turns CFCs into four safe materials: sodium chloride (table salt), sodium fluoride (used in toothpaste), carbon, and carbon dioxide. Since CFCs are generally inert to most chemical processes, this is an important discovery. The CFCs are broken down as the gas is passed through a layer of sodium oxalate at a temperature of 290°C. Past techniques to break down CFCs used extremely high temperatures or highly reactive chemicals, or corrosive, acidic gases were produced in the chemical reactions. This new technique uses a relatively inexpensive, safe chemical that is easily available and no toxic materials are produced. Interestingly, continued research is being conducted on using sodium oxalate at lower temperatures as a mechanism to convert CFCs to valuable fluorocompounds, including beneficial drugs and non-stick surface coatings. CFCs are long-lived, as are most ODSs, so what can we do about CFCs already in the stratosphere? Is there a way to remove them before they break down and start destroying ozone? One of the reasons that CFCs have become a problem in the stratosphere is that they do not interact much with most other chemicals in the atmosphere. This gives them time to make the slow journey from the troposphere to the stratosphere where they break down and release chlorine. It’s really the chlorine atoms that are doing the damage, each a catalyst to destroy hundreds of thousands ozone molecules. UCLA plasma physicist Dr. Alfred Wong has put an innovative idea forth: removing the chlorine atoms by charging them negatively with electrons and gathering them with a positively charged collector. Dr. Wong proposes flying a fleet of high altitude, remote-controlled, solar-powered blimps over the South Pole, where the primary destruction of ozone by chlorine occurs. Each of the twenty blimps, that cost $20 million a piece, would give off electricity to charge the Cl atoms, and then, with a drape of long wires that are positively charged, collect two to three tons of chlorine ions before returning to the ground station to replace the wires. Each year, he estimates that 10 to 30% of the total chlorine in the stratosphere could be removed with the blimps. Dr. Wong’s idea has met both criticism and support as he works to test the science and develop the technology while seeking the funding for this project. The loss of ozone in the stratosphere resulted from technological solution to a toxic problem back in the late 1920s. This loss of ozone has increased the amounts of UV radiation reaching the Earth’s surface, creating health problems for humans, animals, and plants. Since the materials that destroy stratospheric ozone have long lifetimes, this problem will be with us throughout the 21st century. The good news is that the countries of the world recognize the importance and urgency of the loss of stratospheric ozone, have reacted quite quickly in the past, and hopefully will continue this in the future. We have a global monitoring network in place to check ozone levels. This has led to more drastic controls of ODS production and use, and may lead to additional amendments to the Montreal Protocol. However, the total ODS emissions continues to grow as industrial production expands and population size increases. Although banned from production, the long-lived nature of CFCs stockpiled in huge quantities and still in use today will drastically impair the recovery of stratospheric ozone over the next century. In order to restore balance in stratospheric ozone, new developments in technology are needed to recover ODS emissions and destroy or modify the existing ODS stockpiles. Ironically, advances in science and technology created the loss of stratospheric ozone, but also led to discovery of the problem. Now we must combine science, technology, economics, and politics to find solutions.